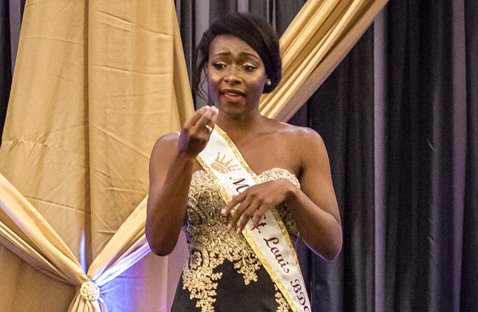 Growing up in St. Louis, Missouri, Sonya Smith, the only Deaf person in her family, faced a long struggle to get an appropriate school placement. Thanks to her mother's advocacy (and after several placements), she finally became an honor-roll student at Webster Groves High School. After two frustrating years at Florissant Valley Community College, she enrolled at NTID/RIT in the Science of Business Technology program, and, at Saunders College of Business, earned a B.S. in Business Administration. Shy and isolated when she entered NTID, she became more confident and empowered. At RIT, she earned a B.S. in Business Administration-Management, and now works at Client Strategist for JM Davis Consulting Group LLC, based in Washington, DC. She works with Deaf and disabled jobseekers and trainees. Being Miss NBDA is a great opportunity to spread the message of empowerment and mentoring, addressing children and youths, giving presentations, providing workshops, to encourage, inspire, and empower her audiences to advocate for themselves and make positive changes.